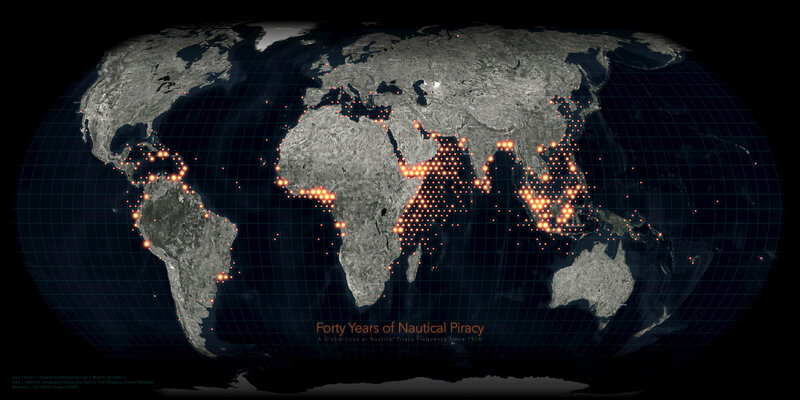 Here is a map showing 40 years (and 8,000 incidents) of nautical piracy. Data with heavily overlapping points, like this, can obscure areas of ultra high-frequency, looking no different from moderate clusters of activity. Aggregation can be a good viz option, and it also provides little cells within which you can create statistical summaries (which I’ll do in a follow-up map). Of course, if you must aggregate, then you should probably use hexagons. Glorious hexagons. And, if you are aggregating into hexagons then they darn well better be equal area. The data comes from the National Geospatial-Intelligence Agency in the form of an “Anti-Shipping Activity Messages” database that they helpfully provide for reasons of prevention, avoidance, analysis, that sort of thing. Here is a web map version of this that you can zoomy-clicky within. But be warned, once you start reading the descriptions of these incidents you will be sucked in like I was in 7th grade when I stayed up all night reading the novelization of Hook (which also has pirates). If, for some reason, you would like to see me build this map, here is a hastily-produced YouTube video where I do just that. The video has a bunch of resource links in the description if you’d like to follow along and build your own. I live in Larnaca and sail the Eastern Med so looked up my region. Three of the positions are way off. One in Limassol is given a position which it says is inaccurate (why?) and two others are wildly out – ons claims to be 24 miles west of Beirut but in fact is 90 miles west of Beirut. The other claims to be ‘off the coast of Lebanon’ but is located on land in Cyprus.